As a genre-focused film site, we are generally more eager to watch a wild white rhino creating mayhem in outrageous and unbelievable action sequences on the big screen, rather than confronting the reality of the extinction of the last male white rhino. Yet a new film that will debut at the Slamdance Film Festival in the coming days is far more brave about it. 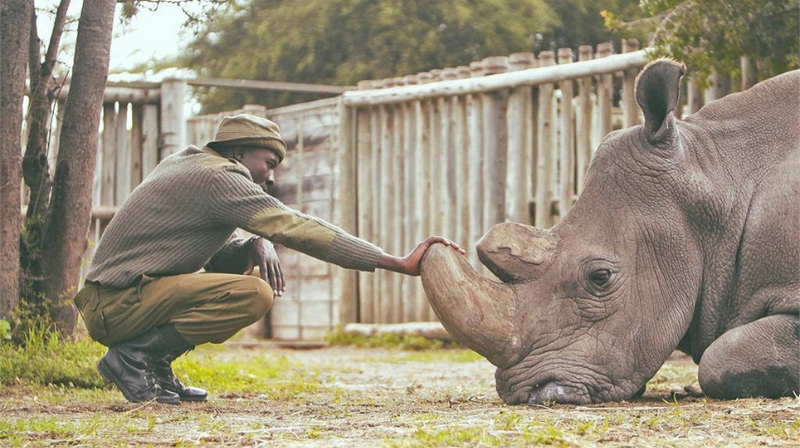 Directed by David Hambridge and produced by Andrew Harrison Brown, Kifaru follows "the lives of two young, Kenyan recruits who join Ol Pejeta Conservancy's rhino caretaker unit - a small group of rangers that care for and protect Sudan, the last male northern white rhino or 'kifaru' in Swahili," according to the official synopsis. "Spanning over the course of the caretaker's first four years on the job, Kifaru allows viewers to experience the joys and pitfalls of conservation firsthand through the lens of these men and view extinction in real-time." Now, maybe it's just my frame of mind today, or maybe I'm just getting older, or maybe I needed a break from my usual fare, or maybe I am, in fact, just a rhino at heart, but the exclusive clip below calmed me down, as the caretaker endeavors to calm down the last male white rhino, called Sudan. Watch the clip below. Kifafu will screen at the Slamdance Film Festival on Sunday, January 27 and again on Wednesday, January 30.